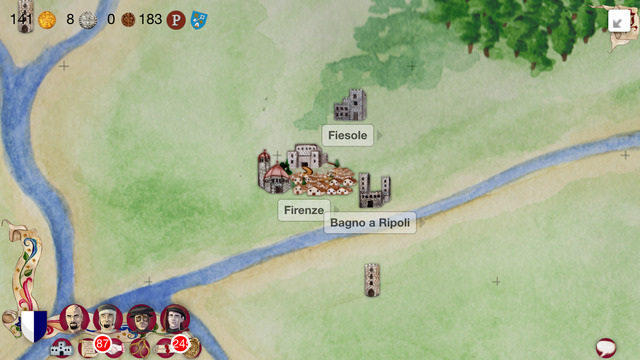 The App, created by the Italian-based company Entertainment Game Apps, allows the player to virtually become a lord of prosperity and transform it into a fortress from a mere village. Players get to rule the master craftsmen, build up their own army, master of arms, herald, treasurer and much more. Since the game has been set in fifteenth-century Italy, the App has been made to cater the need of keeping the medieval feel alive and make it more realistic. The craftsmanship, the economic system, the clans and regions and the battle manners, everything is paid huge attention to, in order to make the player feel that he has traveled back in time. The player can become a ruler, make alliances, propose weddings, raise armies, and fight battles to rise and become the most powerful nobleman of 1434. When players begin the game, they will find that the start with a force of 30 archers, 15 crossbowmen, 25 light and 5 heavy cavalrymen, 30 light and 10 heavy infantrymen, 10 lancers, 1 spy, 1 assassin and five hunters, as well as 50 golden florins. The app provides many interesting missions to complete as well as an option to compete against other players. Further, it also has an option for the player to be elected as a chief, if successful, through elections held every 15 days, so strategize to get on this adventurous journey of becoming the most successful ruler of the game and win honor and fame. Entertainment Game Apps was able to raise over $30,000 in a successful Kickstarter campaign last year, and officially launched the app for Android and Apple users in January of this year.